CULLMAN – West Point played its best volleyball of the season this week. A 9-1 record was capped off by posting six victories on Saturday in the fifth annual St. Bernard Prep School Invitational. The Lady Warriors went through the rest of the competition, losing only one set all day. The momentum they built in pool play took them to the championship trophy, defeating Shoals Christian in straight sets 25-22, 25-15. Shoals Christian was the only opponent to knock off West Point in a set. That came in the Lady Warriors' second assignment on the day. The Flame lost the first set 25-23, won game two 25-23 with West Point coming back in the tiebreaker by a dominating score of 15-5. Shoals worked their way through the rest of the field to get a chance at a rematch with West Point in the title round at the Fazi-Richard Athletic Center. The Flame clinched a berth when they defeated Falkville in their last assignment of the round-robin segment by scores of 25-19, 25-19. What got West Point into the finals was when the Lady Warriors took a pair from St. Bernard 25-11, 25-14. The Lady Warriors then finish their round-robin schedule by downing Falkville 25-5, 25-12. Tournament host St. Bernard had its day of good moments and some tough times. The Lady Saints started the day with a 25-19, 25-13 loss to Shoals Christian. 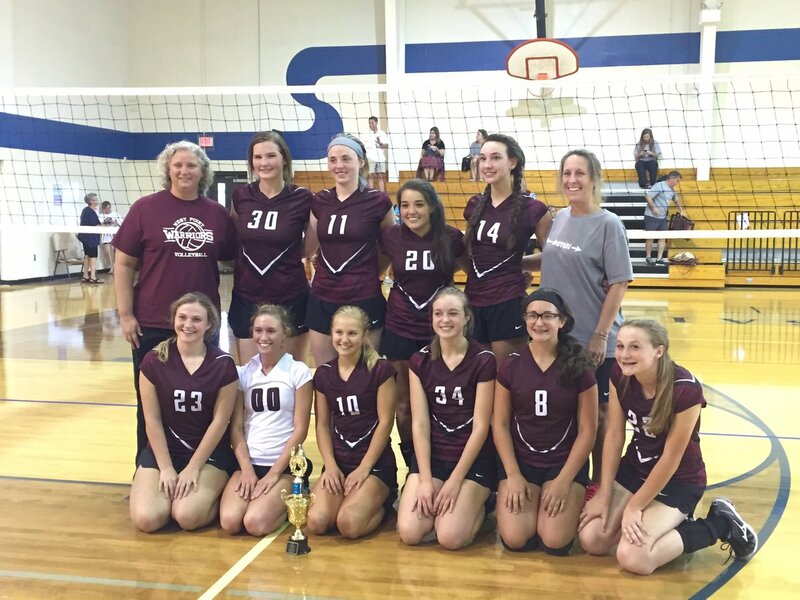 St. Bernard then defeated East Lawrence 25-13, 25-20, but lost their next outing to Lindsay Lane 25-21 and 27-25. Coach Regina Willoughby's Lady Saints then prevailed over Falkville. The Lady Devils were 2-0 entering this point of the tournament. St. Bernard took the Lady Devils 25-22 and a breathtaking 31-29 final. Falkville then spun out of control, losing their final three assignments to go from contending for the title round and finishing with a 2-3 record. St. Bernard and Lindsay Lane had the same record in pool play as Falkville, two victories against three defeats to finish behind West Point and Shoals Christian in the standings. East Lawrence was the only team that didn't get a victory in five decisions. In the championship match, West Point looked superior by going ahead 10-3 and extending it to 20-9 when Meredith Ann Calvert volleyed the ball over the net. Then the Flame caught fire. Shoals went on a 13-4 spurt and was in striking distance at 24-20 with West Point getting nervous. But Regina Jones' Lady Warriors responded when Molly Pendley took a fine pass from Bailee Yearwood and finished with a kill for a 25-22 triumph and 1-0 lead in the match. The first set was played in 22 minutes. A tight second set was displayed early. The Lady Warriors got the lead for good on a kill by Calvert and a 6-5 advantage. Yearwood then went to the service area and scored six in a row to push the West Point margin to 12-5. Moments later, Carley Colburn took her turn serving and was efficient with four straight, getting help up front by Pendley and Jessica King with kills. That enabled the Lady Warriors to go up 18-9 and keep the momentum. A kill from Pendley made it 20-12. Pendley then served three straight to get the Lady Warriors closer to a sweep. Calvert got a service point thanks to a kill from Pendley for a 24-14 lead. Then after a service break, Josie Huckaby put the ball past the Shoals front line and the Lady Warriors ended the week with a tournament title and a .900 winning percentage. The Lady Warriors are now 14-5 on the season with a nine-game winning streak. They resume action on Monday with a tri-match at Jim Boyd Gymnasium against Falkville and Holly Pond. West Point has Good Hope and Vinemont visiting for a tri-match Tuesday then they return to the Athletic Center for a regular assignment against St. Bernard Wednesday afternoon. St. Bernard came to the invitational 2-0 at home with wins earlier in the week over Whitesburg Christian and Falkville. The Lady Saints are now 4-3 on the home floor as they had good efforts in the invitational by Anna Myers, Ashley Duke, Avy Whaley, Isabella Cline and Emma Tafazoli to show a competitive group and take momentum into next week.